The Greek word for olives is elies, pronounced el-YES. The Romans romanized the word, calling them olivas, which is where the English word is directly derived. The English word "oil," comes from the word, "olive." Olives are considered a fruit of a tree. 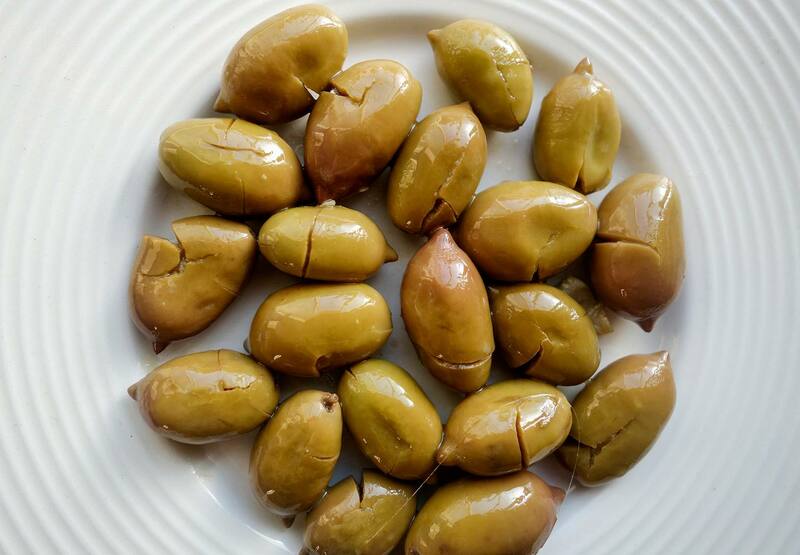 Cretan Greek olives are called elitses, meaning tiny olives. The formal name is koroneiki. 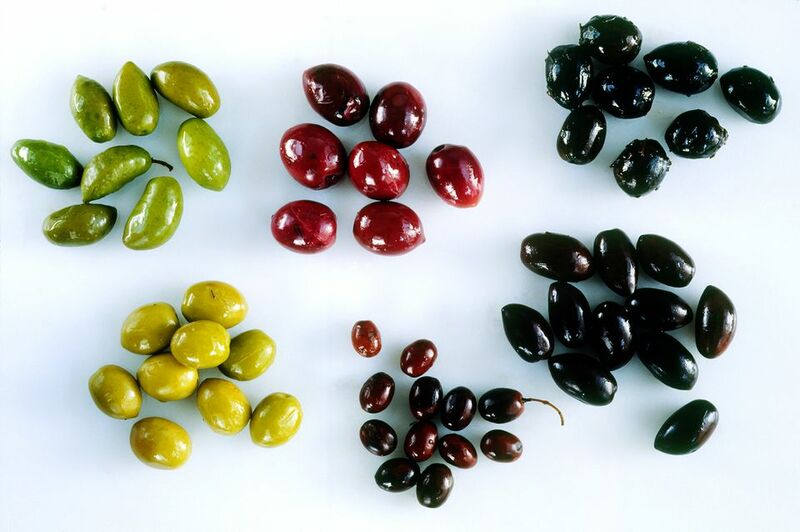 Crete is famous for these tiny olives, which are also cultivated in Messinia, on the Grecian Peloponnese peninsula, and Zakynthos, a Greek Island. Despite their size, they are packed with oil and are the source of some of the world's best olive oil. When green, small quantities are harvested as table olives. When black and ripe (December, January, and sometimes February) they are almost exclusively harvested for the production of olive oil. Most of the table olives are consumed in Greece, never reaching western markets, and the olive oil, famous the world over, is consumed in Greece and exported. Halkidiki olives are large, oval pale green Greek olives commonly harvested while still young in October. Since they are so large, they are often referred to as the "donkey olive." Their large size enables easy stuffing. Common stuffings include dried tomatoes, blue cheese, and almonds. These olives are usually processed through brine curing which gives the olives a firmer meat texture. The olive has a soft flavor with a little tartness and a note of pepper. Often referred to as Chalkidiki, the Halkidiki Olives grows exclusively in Greece in the Halkidiki region which is adjacent to Mount Athos. Nafplion green olives grow in the valley of Argos in the Eastern Peloponnese peninsula. These olives are rarely known outside of Greece. They are a small, light green olive, usually brined. These little gems have a consistent, firm, crunchy texture—slightly nutty, slightly smoky. Nafplion olives are harvested at the beginning of the season in October. These are best served as a table olive, sprinkled with olive oil, lemon juice, and a sprig of fresh dill. Kalamata olives are normally picked when they are fully ripened in December. Kalamatas can be picked earlier, in November. When they are picked early and not fully ripened they are known as "pink" olives for their lighter appearance. These are large olives harvested in November. Plum olives are usually fermented or baked. The plum olive is considered a revival of an ancient Greek variety of olives. The cultivation is made with organic methods with respect to the environment with the old, traditional way. To ferment the plum olive fruit, it is left in water with salt. In time, the olive can ferment without any chemical additives. Probably the most well-known Greek olive, black or deep purple Kalamata olives are harvested in December when fully ripened in the valley of Messina, near the town of Kalamata. The best Kalamata olives are sliced then cured in a red-wine vinegar brine. Perhaps the most well-known of Greek olives, the olive has tight, snappy, shiny skin, and a distinctive almond shape. Kalamatas are served well as a tapenade spread or as an ingredient in a Greek salad. In Greek, wrinkled black olives are the throubes variety. Unlike olives that shrivel up after curing, these are fully mature olives that are not picked. They ripen and shrivel on the tree. Nets are placed under the trees and the olives are caught in the nets when fully ripe. Wrinkling is their natural state. They are the only olives that can be eaten directly from the tree. Also, these olives can be dry cured for commercial use. They are meaty with a strong olive taste and are not used to make olive oil. Most throubes come from the Greek island of Thassos. Favorite ways to serve them are with patatosalata (Greek potato salad), or drizzled with olive oil and sprinkled with oregano.